A cartogram map is a map that varies the size of countries, states, etc. by a variable value. If you like this map type but want to add an additional variable's worth of data to it, this post is for you. Below we list out the steps for creating a bivariate cartogram map in MapViewer 8, so you can create the exact map you need. Click Map | Create Map | Cartogram. In the Import dialog, choose your boundary file and click Open. In the Import Options dialog, set the coordinate system and/or ID/attribute information and click OK. In the Open Data File dialog, choose your data file in the top pane or choose the worksheet containing the data from the Use loaded worksheet dropdown list and click Open. Select the cartogram map layer in the Object Manager. On the Map page of the Property Manager, set the Cartogram type to the type of cartogram map you want. Dorling changes the areas to circles, Non-contiguous keeps the area shapes but loses connectivity between adjacent areas, Contiguous keeps connectivity between adjacent areas at the expense of shape. On the General page of the Property Manager, make sure the Variable column is set to the proper column from your data file, and then check the box next to Retain cartogram and uncheck the box next to Retain original areas with cartogram. Click Map | Create Map | Base to change the cartogram map into a base map. Click Map | Create Map | Hatch. This creates a hatch map using the original data file and the boundaries from the new base map. By default, the same variable used in the original cartogram map will be used for the hatch map colors. To change this, select the hatch map layer in the Object Manager, go to the General page in the Property Manager, and change the Variable column. If you wish to use a different data file altogether, you can click the open file icon next to Data file on this same page. 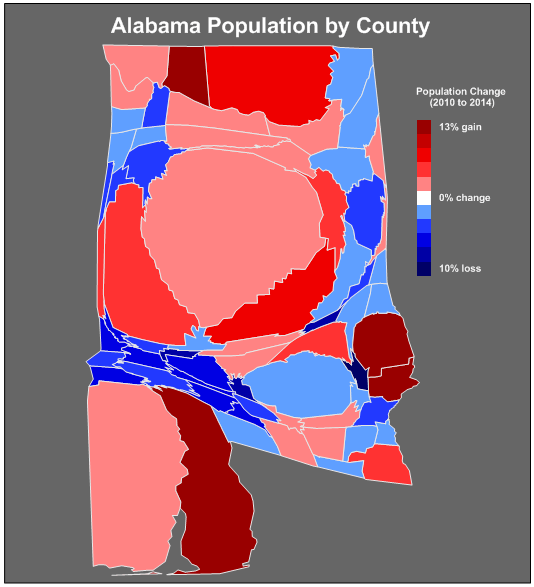 This bivartiate contiguous cargotram map of Alabama, created in MapViewer 8, shows 2014 population as the size of the county and population change (2010 to 2014) as the color of the county. Data is from the United States Census Bureau.